Bust of Pakal the Great, found at Palenque. The photos in this posting include some I took at the Palenque ruins, some at the Palenque museum, and a few from the great National Museum of Anthropology of Chapultepec Park in Mexico City. 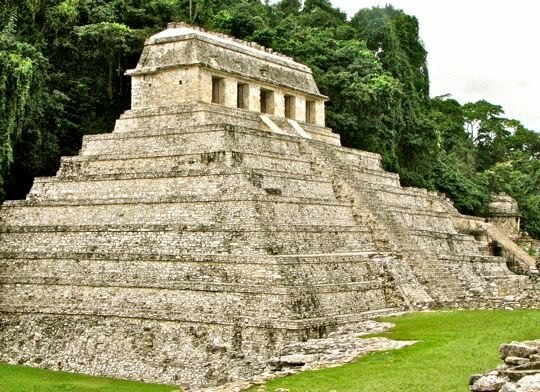 In this second of my 2-part series on Palenque, I will focus on the Maya city's greatest ruler, as well as some of the the wonderful architecture he and his sons caused to be built. The civilizations of the Olmecs and Teotihuacan, both of which have been shown previously in this blog, continue to be great mysteries due to a lack of a written Teotihuacan language, and the failure (to date) to translate such Olmec writings as survive. That we know so much about Pakal and his predecessors and descendants is due to the highly sophisticated Maya writing system and calendar. This writing system was only translated in the 1970s, after centuries of unsuccessful efforts. Ironically, the person who was in great part responsible for deciphering the Maya language was not an archaeologist or cryptographer, but Dr. Linda Schele, an art historian. Until then, all we knew of the ancient Maya people was their mastery of art and architecture. When the Maya hieroglyphics were deciphered, a curtain was suddenly lifted on centuries of history. Real individuals emerged from the mists shrouding the ruined cities of the Maya jungles, revealing people who lived and died, achieved great things and met profound defeats. For a map of the major Palenque sites I describe in this posting, click here. Temple of the Skull marks the beginning of the great plaza at Palenque. This temple (also known as Temple XII) sits on a large platform that runs to your left along the base of the heavily jungled hill behind it. It is is the first of a row of three great structures, the next of which may be the tomb of Pakal's mother, known as Temple XIII, and then Pakal's tomb, known as the Temple of the Inscriptions. The Temple of the Skull got its ominous name from a stone rabbit's skull carved on one of the temple supports. 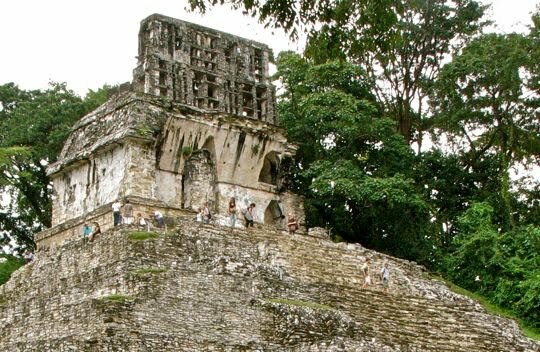 It is also known as the Temple of the Dying Moon, because a dead rabbit was associated in the ancient Maya mind with the waning (or "dying") moon. The base of this pyramid probably dates to the 6th Century AD. The Temple of the Skull was built on top of the earlier base sometime in the 8th Century AD. A grave found in the earlier structure contained over 700 pieces of jade, a semi-precious stone highly valued by the Maya and typically worn by people of very high status. Although it is not one of the larger and more imposing temples at Palenque, the envelopment of the Temple of the Skull by the looming jungle was evocative of every "lost city" tale I can remember. Temple of the Red Queen. It is believed by some that the remains of the woman found in this tomb belong to Sak K'uk, mother of Pakal. Under Palenque dynastic custom, women could only rule when there was no male heir. Sak K'uk's husband, Muwaan Mat, died before his young son was old enough to rule, and so Sak K'uk ruled for 3 years until K'inich Janab, known as Pakal or Sun Shield, became 12 years old. 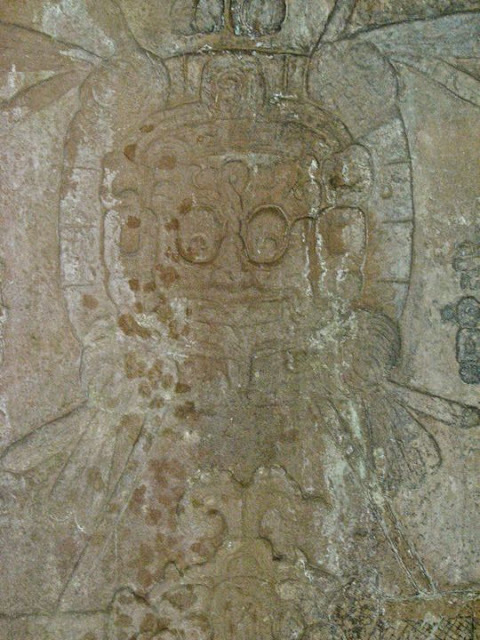 In the administrative and ceremonial center called the Palace, seen in Part 1 of this series, a bas relief wall carving shows Sak K'uk presenting Pakal with an elaborate head dress, apparently at his coronation. He seems to have revered his mother, and may have built this tomb for her next to his own. Whatever the real identity of the tomb's occupant, she was an extremely important person to have such a monument. She was found covered by red cinnabar (hence the name), and dressed in fine jade jewelry. The bodies of a young woman and a child lay next to her crypt, apparently ritually killed so they could assist her in the afterlife. The tomb wasn't discovered until 1994, a demonstration that Palenque, of which only 10% has been fully excavated, has many more surprises in store. Temple of the Inscriptions, tomb of K'inich Janab, the Great Pakal. This temple is sited just to the left (east) of Sak K'uk's tomb. 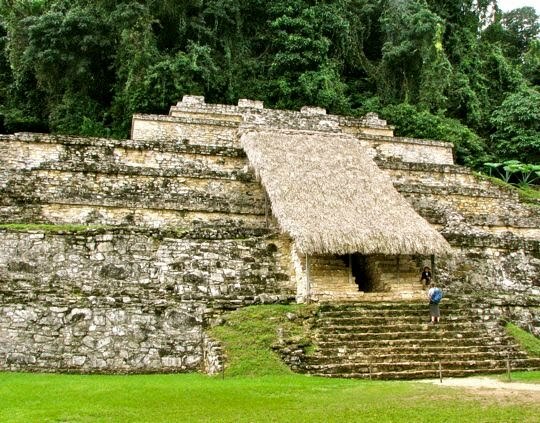 It is the largest and most impressive structure in Palenque, with the possible exception of the Palace. Once crowned, Pakal became the Ajaw, or ruler, of Palenque on July 29, 615 AD. He ruled for 68 years, dying in 683 AD at the ripe old age of 80, extraordinary longevity for a man of his time. 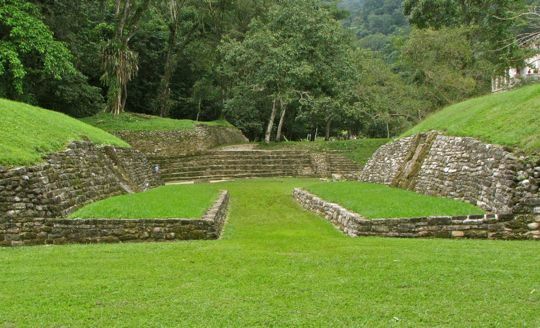 The earliest settlement of Palenque was around 300 BC, but until 600 AD, the community was rather unexceptional. 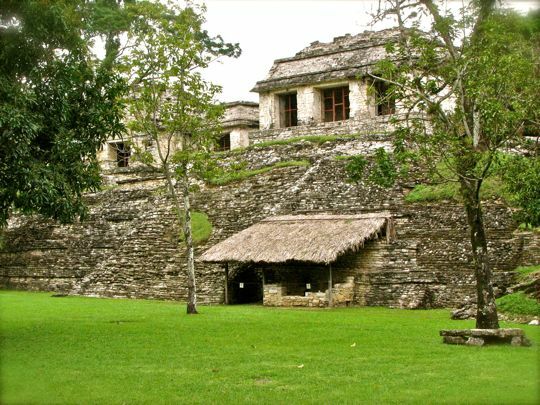 The name "Palenque" is a Spanish term meaning palisade or stockade, and refers to post-Conquest Maya descriptions of the jungle ruins as "strong houses." 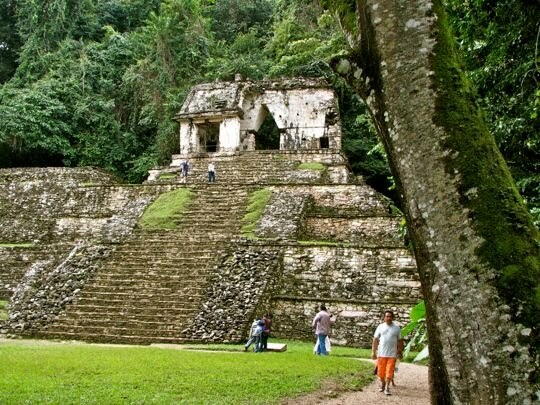 The original Maya name for Palenque is Na Chan Kan, which means City of Snakes. K'uk Balam became Ajaw in 431 AD. He founded a dynasty with 16 successors which lasted until the beginning of the 9th Century AD. In 611, Palenque suffered a great disaster when it was invaded and sacked by the neighboring city of Calakmul. The next year, Pakal's mother came to the throne, and Palenque's golden age began. The reigns of Pakal and his two sons K'inich Kan B'ahlam II (Ajaw from 684-702 AD), and K'inich K'an Joy Chitam II (Ajaw from 702-720 AD), lasted altogether for more than 100 years. During this period Palenque flowered in art and architecture as never before. Finally, however, another neighboring Maya city called Toniná defeated and invaded Palenque at the end of K'inich K'an Joy Chitam's reign. As the 8th Century wore on, Palenque began to fade. 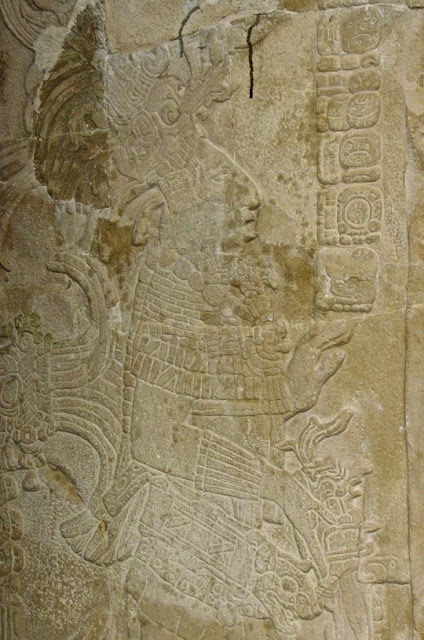 The 17th Ajaw of the dynasty, Wak Kimi Janab Pakal, the last recorded Ajaw of Palenque, took the throne November 17, 799. 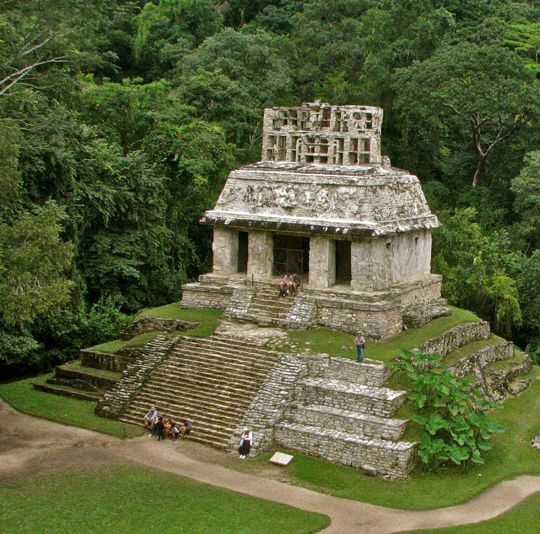 In the following century, Palenque declined rapidly, with ritual activity ceasing in 810 AD. By 900 AD, the city was abandoned to the encroaching jungle. 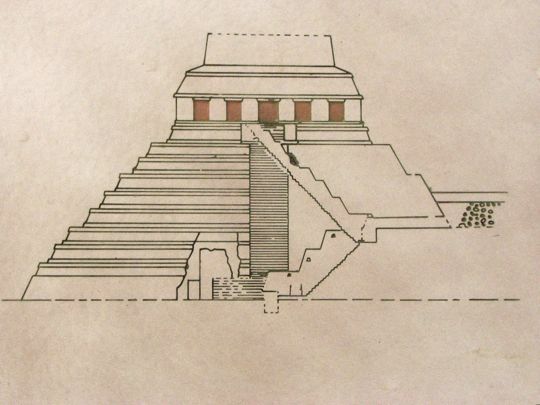 Cutaway of the Temple of Inscriptions, showing stairway to Pakal's tomb. Various Spanish, European, and American explorers visited Palenque's ruins after the Conquest, beginning with Fray Pedro Lorenzo in 1567. Later, various military detachments stopped there briefly. Still later came adventurers such as "Count" Waldek in the 1830's. Probably the most important visit was by the famous team of John Stephens, an American travel writer and Frederick Catherwood, and English artist. These last two are credited with bringing the ancient Maya civilization back to life with their book "Incidents of Travel in Central America and Yucatan", published in 1841. The investigation of Palenque took off after that. In 1952, a Mexican archaeologist named Alberto Ruz Lhuillier was puzzled by some strange plugs he noticed in the stone floor at the top the Temple of Inscriptions. Investigating further, he found a hatch in the floor which concealed a hidden staircase leading down into the temple. After two years of laborious excavation, he became the first human being in over 1000 years to view the hidden crypt and remains of the Great Pakal himself. The cutaway above shows the route of the staircase down to the very base of the Temple of Inscriptions. Archaeologists later realized that the crypt was built first and then the Temple was constructed over it. After Pakal was interred, several young men were sacrificed in the crypt to help him into the underworld, and the stairway was carefully filled with rubble and sealed at the top. Pakal's sarcophagus. The heavy stone box is beautifully carved, as are the walls of the crypt. Carved bas relief images of Maya warriors and gods surrounded Pakal on all sides. The thousands of visitors to the crypt caused considerable wear and tear, so tourists have now been barred. The Mexican government created exact reproductions of the crypt and its contents which are on display at the Palenque Museum and the Museum of Anthropology in Mexico City. 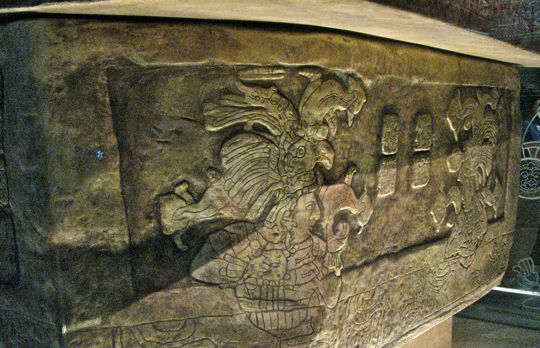 The sarcophagus shown above is a reproduction in the Palenque Museum. 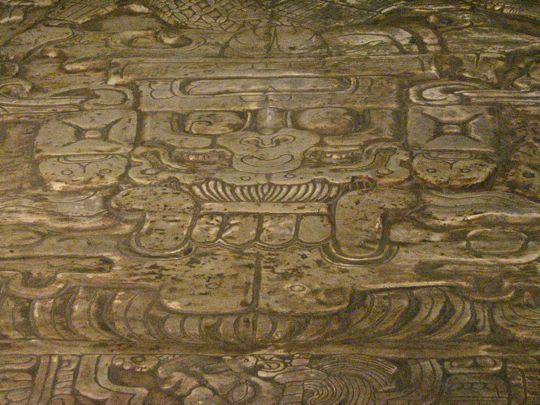 Closeup of the lid of Pakal's sarcophagus. The lid is huge and thick and weighs several tons. The only way it could be opened was with automobile jacks, an inch at a time. 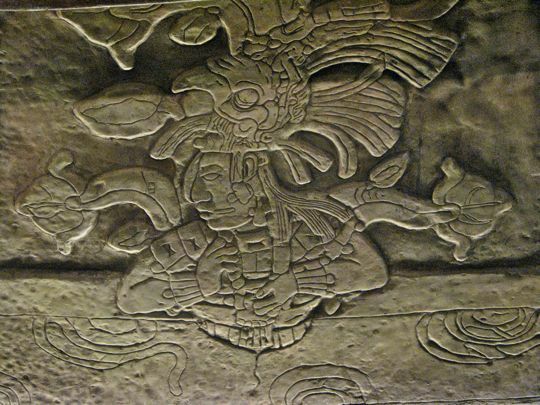 The intricate carving shows a serene Pakal falling into the mouth of a monster who represents the underworld. The discovery of Pakal's crypt is at least equal in significance to that of Tut Ankh Amun ("King Tut") of Egypt. Until then, it wasn't clear whether the great ruler was real or simply a mythological figure. Closeup of a Maya warrior on the side of the sarcophagus. Every detail of a carving such as this had deep religious and political meaning to the Maya, some of it known, much of it still a mystery. 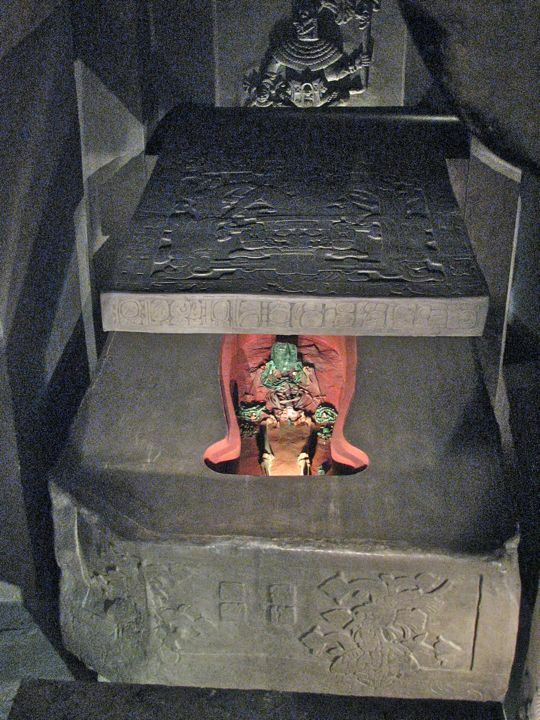 Pakal's last resting place. Ruz Lhuillier slid the lid back, and Pakal was revealed inside, covered with a red powder and richly adorned with jade finery. 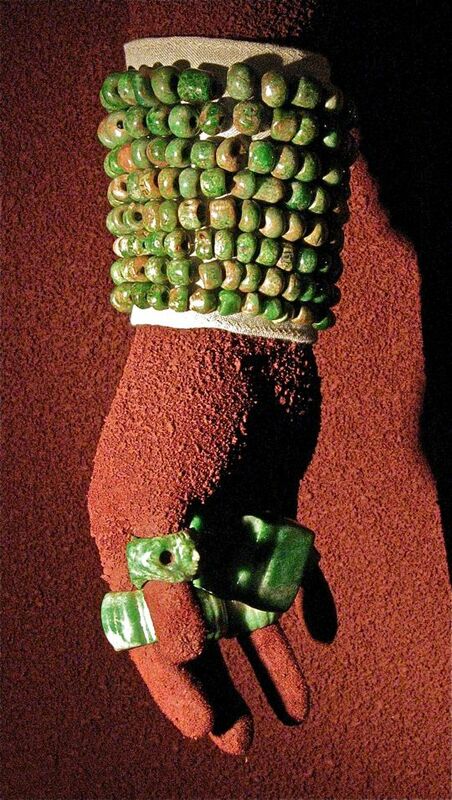 Pakal's actual remains and the jewelry are now in the Museum of Anthropology in Mexico City. In the background of the picture, a warrior god stands guard. One of these gods adorned each wall of the crypt. 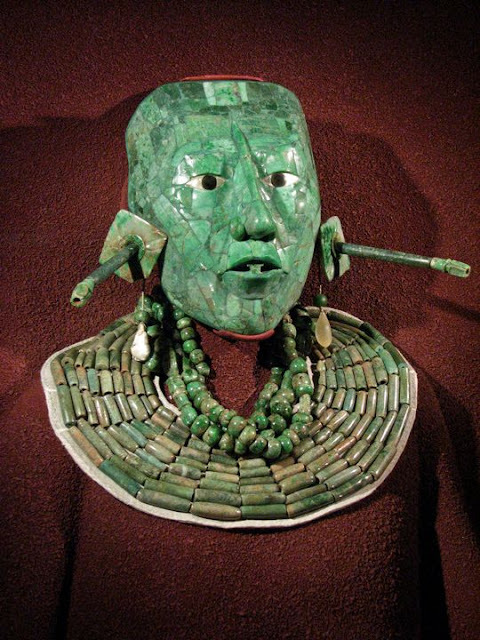 Pakal's exquisite jade death mask and jewelry. The death mask is amazingly lifelike and detailed. 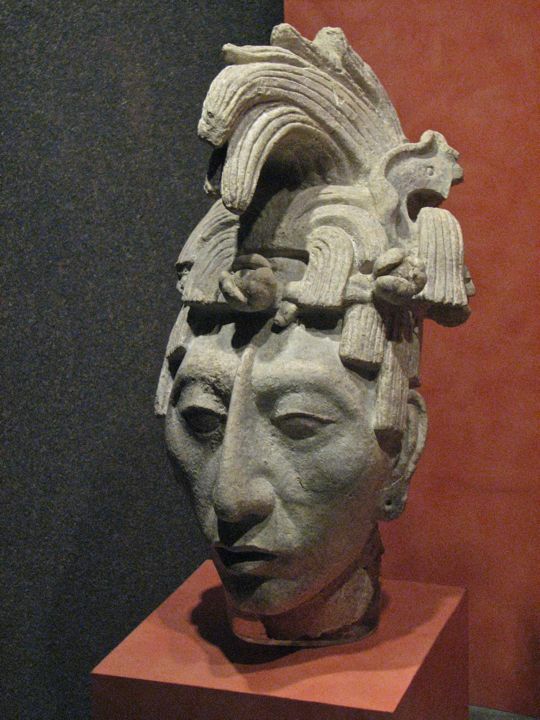 The earrings with the long plugs were very much the fashion for important characters in Pakal's time. To read about a great Maya ruler from the ancient past is one thing, to view his remains and the objects he actually touched or wore is an entirely different experience. Photo from the Museum of Anthropology in Mexico City. Jade bracelets and rings adorned Pakal's wrists and fingers. In the palms of Pakal's hands Ruz Lhuillier found strange circular and rectangular objects with a mysterious religious significance. Photo from the Museum of Anthropology in Mexico City. Temple of the Foliated Cross. Pakal's oldest son, K'inich K'an Bahlam II, launched his own building program. After completing his father's tomb, K'an Bahlam (sometimes called Chan Balam) began work on another group of tomb/temples. These are called the Cross Group by modern archaeologists. The Cross Group surrounds a plaza atop a small plateau just above and to the east of the great plaza where the Temple of the Inscriptions and the Palace are located. Unlike some other Meso-American cities like Teotihuacan, Maya cities were never built in a grid pattern. Palenque has an organic appearance, being molded into the existing terrain in a way that is very pleasing to the eye. Above, the Temple of the Foliated Cross sits on top of a pyramid now covered with grass and jungle. The front section has fallen away, giving a view of its interior construction. All three of the major temples of the Cross Group are laid out in a similar pattern. The name of this temple comes from a cross carved on a tablet inside. To the Maya, a cross symbolized the Ceiba, or the Tree of Life which connects the underworld with its roots to the heavens with its broad canopy. Representations of K'an Bahlam (Maize Jaguar) are present in each of the three temples. In the Temple of the Foliated Cross, he is shown as a boy. His name, Maize Jaguar, evokes two of the most powerful Maya symbols. Maize was the economic underpinning of the entire Maya world, and the jaguar was the jungle's largest and most powerful predator (aside from Man). Temple of the Sun. Directly facing the Temple of the Foliated Cross is the Temple of the Sun, with the best preserved roof comb of any structure in Palenque. Roof combs were a unique aspect of Maya architecture. The purpose of a roof comb is not entirely clear, but it contained political and religious symbolism. K'an Bahlam appears as a young man in this temple's bas reliefs. He is accompanied by an older adult figure, which may represent his father Pakal the Great, or himself as an adult. Between the young man and the older one is a shield with the face of a jaguar sun, representing the god of war and of the underworld. 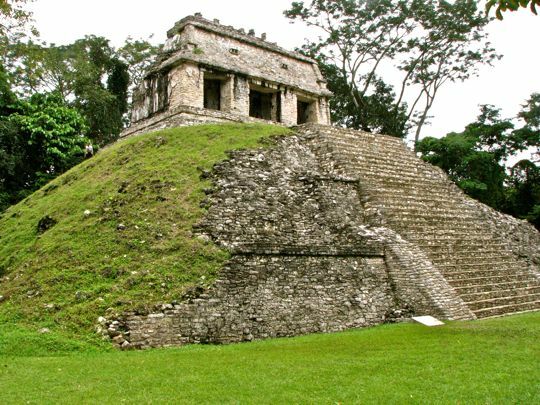 This temple commemorates K'an Bahlam's accession as Ajaw of Palenque in 684 AD. Temple XIV was the little brother's gift to the site. To the right of the Temple of the Sun is the modestly named Temple XIV. It was built by K'inich K'an Joy Chitam II, the younger brother of K'an Bahlam. He ruled only 9 years and was captured by the invaders from Toniná, who may have taken him back to their city to be sacrificed. On the other hand, there is some evidence he may have still been around in 720 to dedicate some additions to the Palace. The record is unclear. A number of human sacrifices have been discovered immediately around this temple. The Temple of the Cross, the largest of the Cross Group. While the Temple of the Foliated Cross shows K'an Bahlam as a boy and is associated with maize and agriculture, and the Temple of the Sun shows him as a young man and is associated with war and the underworld, the Temple of the Cross represents K'an Bahlam as an older man and associates him with the deity Chaak. Closeup of the Temple of the Cross and its roof comb. The Temple of the Cross is the largest of the Cross Group and the third largest structure in Palenque, after the Temple of the Inscriptions and the Palace. From the top, one can view most of the major structures in Palenque and the broad plains of the Usumacinta River Valley stretching out to the north. Inside the temple is a sanctuary tablet showing K'an Bahlam facing his father Pakal, separated by the cross representing the Ceiba Tree of Life. The existence of the cross as a central symbol in Maya mythology made it somewhat easier for Spanish priests to make the connection to the Christian cross, and indoctrinate the Maya into Catholicism. The monster-god Chaak, inside the Temple of the Cross. This was the ruling deity of the temple. It is somewhat worn, but retains its wide-eyed and rather fearsome aspect. By associating themselves closely with Maya gods, the Ajaws tried to appear divine themselves and thus justify their rule. 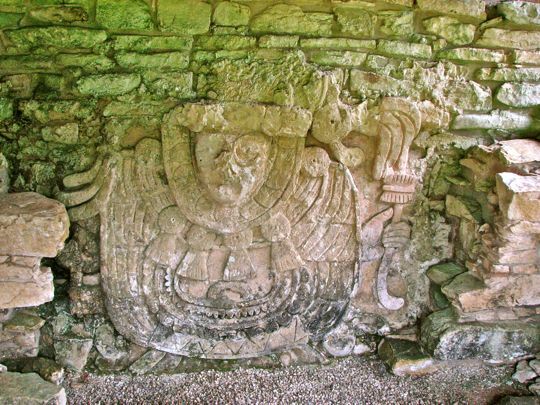 K'inich K'an Bahlam II, bas relief in the Temple of the Cross. He appears older here than in the other two temples he built. In building these three temples on a height overlooking his city, K'an Bahlam created a major ceremonial center around himself, focused on his connection with various important gods and major Maya symbols such as maize, the sun jaguar of the underworld, and the Ceiba tree. A modern politician would immediately recognize the desirability of connecting oneself with important religious, cultural and political symbols. 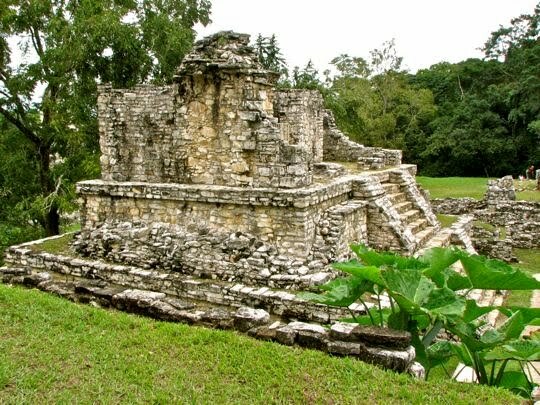 No doubt K'an Bahlam's architectural additions to Palenque impressed his people and visiting dignitaries from other Maya cities. They certainly impressed me. The Ball Court. The Ball Court and the games played here were important not only in the Maya culture, but throughout Meso-America from the earliest days of the Olmecs through the Aztecs at the time of the Spanish Conquest. The Ball Court was associated with the god of maize and the underworld. The games themselves were re-enactments of the victory of the Maya Hero Twins over the gods of the underworld, and the freeing of the god of maize who came to the surface and gave the Maya the gift of corn. This court is the only one in Palenque and is one of the oldest in the Maya world. It appeared unusually narrow until I realized that the low platforms on either side of the narrow lane in the middle were part of the playing field too. No one knows for sure what the rules were. Human sacrifice appears to have played a role. It may have been the captain of the losing side, or maybe his whole team, who became the victims for the sharp obsidian knives of the temple priests. The Count's Temple. This temple became the temporary home for the self-described "Count" Jean-Frédéric Waldeck. He was a man who "never let the truth get in the way of a good story." He claimed at various times to have been born in Paris, Prague, or Vienna, to be German, Austrian, or English, and to hold the title of Count, Duke, or Baron. Between 1834-36, he visited Palenque and made numerous drawings. Many of these were published in a book in 1838. Some of his drawings made Maya sites look Egyptian. To please other backers, he propounded the ideas that the ruins were from the Lost Tribes of Israel, or were actually Atlantis. It just depended upon who was paying him. Later archaeologists discovered three tombs in the temple, with jade offerings. The North Group Temples. The Count's Temple forms one end of a plaza surrounded by the North Group of Temples. This group sits at the edge of a plateau, to the north of the Palace, with the Ball Court in between. 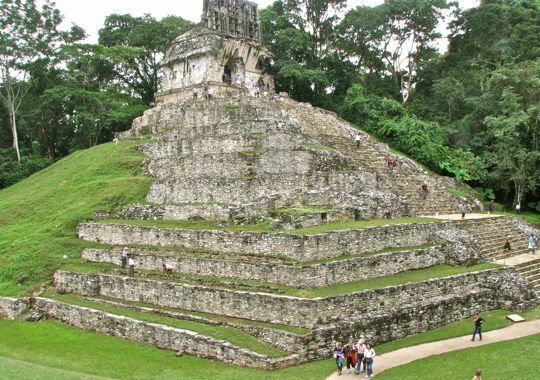 These structures are significant because some parts of them date back as early as 325 AD, with the latest additions occurring between 625 and 700 AD, the period of Pakal and this sons. They are also unusual because a large number of domestic household materials were found in them, including manos and metates for grinding maize, obsidian blades, and a furnace. Apparently people lived here during the first half of the 8th Century, again during Pakal's time. The palapa (palm frond) shelter covers a recently discovered stucco sculpture. A wide-eyed monster-god peers out from the past. There was no sign with information about this stucco sculpture, found at the base of the North Group of Temples. I have been unable to find any further information on it, but it was certainly striking. The left hand of the monster-god appears to be holding a torch. This was my last picture of the Palenque ruins, as we hurried to the bus. Modern link to a distant past. 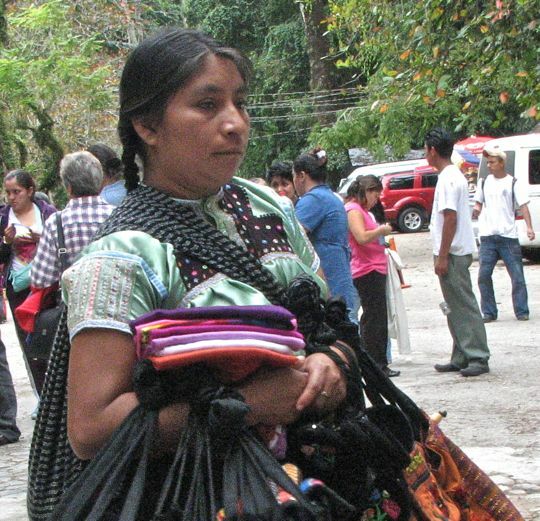 This Maya woman waited patiently for customers among the throngs unloading off tour buses in the Palenque ruins parking lot. The Maya people have endured unbelievable suffering and social disruption since the Spanish first landed on the Yucatan Peninsula in 1517. Still, they have maintained their culture and language in the face of it all. Recently, archaeologists have been teaching them to read the ancient hieroglyphs so they can re-discover their history. 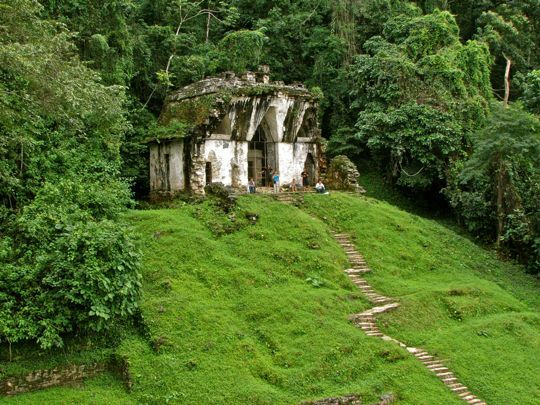 This concludes Part 2 of my series on the mysterious, jungle-clad ruins of Palenque. Next, I will show our visit to Merida, the old colonial capital of Yucatan. I hope you have enjoyed Palenque, and that I have not overwhelmed you with strange names and unfamiliar history. Palenque has so many great stories to tell that I could have done three or four more posts. But enough is enough! Go visit yourself! If you would like to leave a comment, you can either use the comments section below, or send me an email directly. If you leave a question in the comments section, PLEASE leave your email address so I can answer you. Hi Jim and Carole, loved the post, Billy and I love places like that, so much is still unknown. See you soon. that was wonderful, thank you! Last week I went to see and hear the Schola Cantorum de Venezuela and was struck by the faces of the chorus members, so different from those we've seen in Mexico. There were two black men, in particular, whose faces made me wonder about their African origins. However, Pakal the Great, in your first photo, looks very similar: the high cheekbones, the long, angular face! Can there have been some connection long, long, ago? My mind is ticking . . .